Our ratchet strap fittings provide the ideal way to secure loads in a range of environments. You can buy buckles with short wide ratchet handles that do not take up much room but still provide you with a powerful way to activate the locking mechanism and tighten the strap. These wider than normal handles can be fitted to wider webbing straps to ensure larger loads are held more firmly. Built to last and available as part of our custom strap assemblies, these short wide handle buckles are a compact alternative to our long wide handle buckles. These short handle models means that they can still encompass a comprehensive, hard wearing locking mechanism that will ensure that the buckle does not come loose at any point during transit. If you have need of a short wide handle solution that is a bit more resistant to corrosion, then our stainless steel units will be a sensible investment. They will withstand exposure to marine environments and still provide the same basic benefits as their standard counterparts. 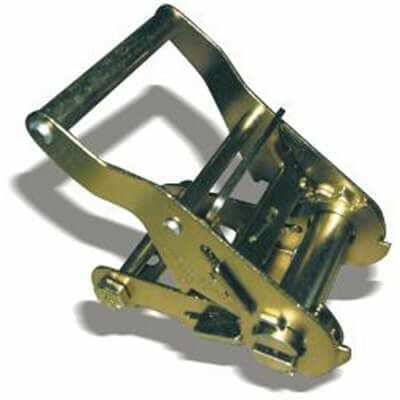 Be sure to browse our extensive range of ratchet strap fittings if these short wide handle buckles are not fit for your requirements. We design and manufacture high quality products of all types. Confused by Short Wide Handle Ratchet Strap Fittings? If you are uncertain about any of the ratchet strap fittings we sell, don’t suffer in silence. Instead, you can contact us by calling 01384 78004 or using our site to get helpful advice on all of the products available at Rope Services Direct. Short Wide Ratchet Handles Overall rating: 5 out of 5 based on 6 reviews.